How many SKUs should a firm offer? 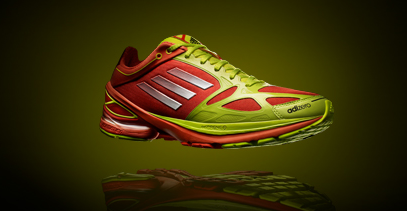 Herbert Hainer, CEO of Adidas AG, announced last Saturday* that the company has plans to cut 25% of its 46,897 SKUs. An argument used by Mr. Hainer to justify their decision is that 20% of the current assortment generates 80% of sales. If this roughly is the case–which should not be surprising, according to Pareto’s law, it means that 80% of the assortment accounts for 20% of sales. And most likely, within the remaining 80% SKUs, Pareto’s law still holds, i.e., 80% of that 80% account for 20% of the remaining 20% of sales, and so on and so for. 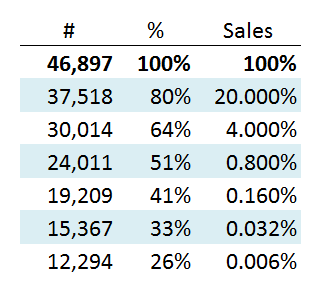 Working in this fashion we can prepare the following table for how much the SKUs with the least sales sell. As the last row shows, cutting SKUs by 25% means removing those items that contribute to 0.006% of sales, or $1.2m, since Adidas sells roughly $18b. Remarkably, those 12,294 items only sell $83 (roughly 1 unit) on average worldwide! Therefore, it makes a lot of sense to remove them from the assortment. The natural question to ask at this point is why pruning 25% of the items and not more. Should Adidas also remove the second-to-last row items (15,367 SKUs! ), which sell $400 on average worldwide? What about the third-to-last row? These question nicely illustrates the usual trade-off between Marketing and Supply Chain departments in the retailing industry. A marketing-driven organization, like Adidas, argues that adding an SKU to the assortment increases sales. The more variety offered, the higher the chances that the customer likes whatever is on the shelf thus the probability of making one additional sale. The penalty to pay is in the form of, mainly, inventory holding cost and ordering cost. In good times (Adidas increased sales by 10% last year) this penalty tends to be underestimated. Indeed there is no clear answer to the question posed above, but we can have a look at other industries to shed some light on the issue. For instance, in the telecommunication telephone manufacturing industry, Apple sells only 2 SKUs (i-phone 4, either black or white), whilst Nokia sells at least one model for each market segment (for instance, it sells 37 different models only in Germany). Other successful companies have followed the same trend of reducing the number of SKUs to focus on reducing supply chain costs. Good examples include Lidl in Germany or Mercadona in Spain. A holistic view of the company is necessary to make sound decisions when answering the question of ow many SKUs in the assortment are needed. Supply chain costs should be carefully pondered before blindly following the advice of marketing experts. Why does a CEO even care about SKU level detail? Management should focus much more on channel/product/business lines that are unprofitable. Maybe Adidas has some size 20 US shoes (what is that in European sizes? 60?) that they only sell one of, but as long as they still make money and the supply chain is matched to the frequency of orders, the number of SKUs might still be viable. If those SKUs aren’t stocked and only available via custom order then why kill them? Offering a full lineup of goods that are all profitable is one of the advantages of being a dominant player in an industry. Jonathan, I agree that a dominant player may obtain a competitive advantage through a wide assortment. Having said that, there is always a trade off between the expected benefits and the expected costs of having one additional SKU. If the expected benefits are extremely low (selling 1 unit worldwide is not that much for those 12K items, is it) those cannot overweigh the expected costs, which include not only inventory holding cost, but also design, marketing, and ordering costs, to cite some. Therefore, it does not make economic sense to keep them in the assortment. Finally, CEOs do not have to care about individual SKUs. True. But were are talking about removing thousands of them (25%!) then, yes, it is a strategic decision a CEO should pay attention to. Aside: I like Jonova very much.